I am a wife, mother of two college students and have a Siamese cat. I have a Master’s degree in Library and Information Studies (MLIS) and have been working in my local public library since 1982. 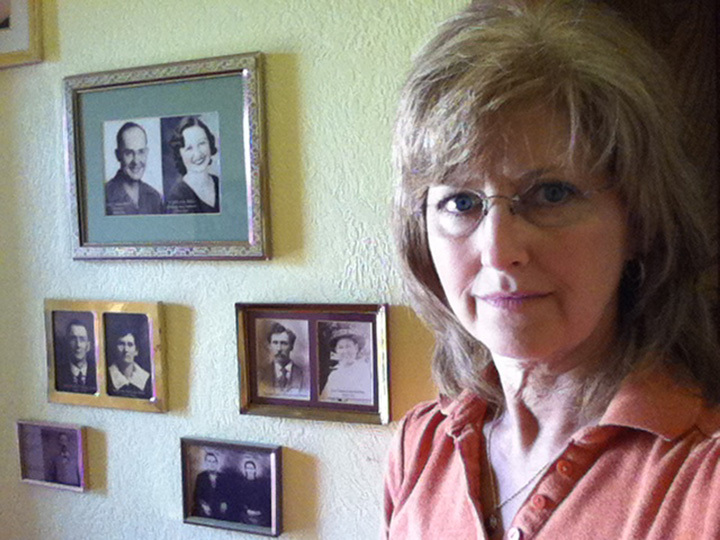 I am the self-appointed family historian because I enjoy researching and collecting family stories, genealogy and photos. Why have I started this blog? To preserve and share my families stories as well as track my research progress. As far back as I can really remember I had an interest in my family history. Perhaps it stemmed from my father telling me stories of when he was a boy or his decision to meet his biological parents when I was 6 years old. I recall with many of my visits with my grandmothers asking them if I could look at their photo albums and asking them who the people were in the old photos and to tell me stories about their lives. I really do not know what specific event may have influenced my interest in genealogy. But I do know that when I was 11 I visited my great Uncle Leonard in Virginia, he owned an antique store in small rural town, and he took us on a tour of where he and my Grandmother were raised after their parents died. A few months later I wrote to him and asked for more information on the Lineberry history. His response to me treated me as an adult with a serious interest and he provided me with the information I requested. As an 11 year old I didn’t have the skills to do any research but I saved that information and many years later I pulled it out and started my quest for more family histories. Right now on my genealogy website are not only the specific lineage information but also letters and photos I acquired. Some of them I can look at and read again and again. Recently I added a site called Keith & Kay Bauman’s Family History and Ancestry, www.kbaumantreehouse.name, which has the capability of including even more information in a database for easy searching and hopefully the name is easy to remember. You and Your Genealogy Blog Have Been Spotted! Hello, I just found out that my great great great grandfather is Isaac Lennox who changed his named to Isaac Brown, and that he was raised in holland by a family that was not his. And that he changed his name to Brown after the family that raised him. I am trying to find my family history. I think we might be related. My grandmother’s maiden name was Florence Brown. Sister of Mary Brown that married Floyd Fales I think. My grandmother came from Enid Oklahoma. Could you contact me with some info Please. I think we might be related. I’d say we are definitely related. If I calculated correctly we are 3rd cousins and Issac and Mary are our common ancestors. I descend from Isaac and Mary’s son John. Isaac and Mary are my great, great grandparents. My email is kayzie31@gmail and my website with the family tree is located at http://freepages.genealogy.rootsweb.ancestry.com/~kayz/ (My Tree House). Have been doing research on the first 6 women grads of University of Mo medical school and have come to know and admire Dr. Jane Dunaway. Several years ago made contact with some relatives in St Louis (Steve and his mom), and a niece in Denver. Would love any photos of hers- want to do a book someday. Did you know she was a great basketball player? Excellent! I’ll contact you directly. I just found your blog and love the way you focus on memories and stories. I’ve been researching for years and have mostly ended up with lots of dates and certificates which tell me nothing about the people, so I’ve just started my own blog writing the life story of one ancestor at a time. I can’t believe how time consuming but how satisfying it is. Unfortunately I don’t have many old relatives left (I’ve moved up that chain myself!) and I’ve found that a lot of the family memories have turned into family myths when put under the spotlight. Which is fun in itself! Best regards – I look forward to reading your posts and stories. Thank you. All the supporting information is interesting to seemingly few but the stories that develop from all that documentation is often interesting to many. I appreciate you taking the time to comment and I hope you enjoy blogging about your finds. I just started my genealogical research on Ancestry.com. I am one of the many ( many!) descendants of Albid Nigh Bauman, as I discovered last night. My grandfather was Charles Zacky Bauman, son of Albid and Julia Clementine Martha. My father was Robert Nigh Bauman, oldest son of Charles Z, ( or Doc as he was called) . We grew up in Dallas and moved to Amarillo in 1966. I am very excited to discover your website! As I am a newbie in the genealogical circles I’m not sure what to do next, but I can give you information about the descendants of Charles Zacky. Charles, or Doc died when I was 2, so I don’t remember him, but I do have an article about him that is quite interesting. Again, I am a real newbie in this arena, especially in navigating Ancestry.com., so any tips would be welcome.